The vast majority of women whose youngest child is under 6 are in the labour force. 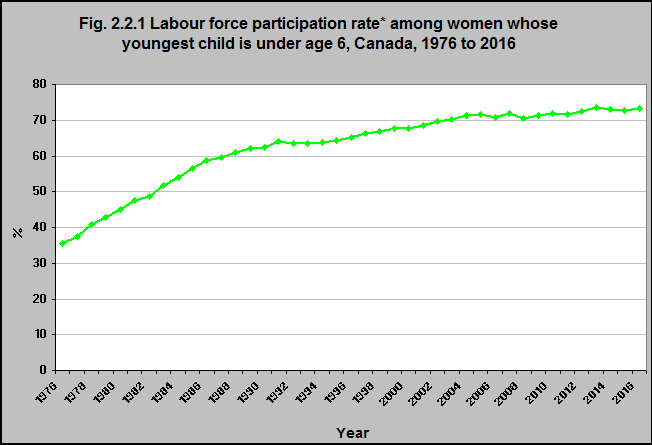 In 2016, 73.3% of women whose youngest child was under 6 were in the labour force. This rate has doubled since 1976 when it was 35.6. The rate rose most sharply between 1976 and 1991, then it increased at a slower rate until 2010 – after that it has leveled off. The majority of women with children under age 6 are in the workforce. That means that the majority of families of young children have to balance the needs of their children with the demands of their jobs. Workplace policies that support families are an important component of any plan to improve the health and well-being of children.